This entry was posted in Uncategorized on February 26, 2015 by Gary. This entry was posted in Uncategorized on February 25, 2015 by Gary. This entry was posted in Uncategorized on February 23, 2015 by Gary. I’ve watched for several years now has one analysts after another has tried to call the top of this bull market. I would argue that the world is in a severe deflationary environment and in order to hold those deflationary forces at bay central banks simply can’t allow stock markets to top. The Fed made the mistake of allowing stocks to crash in 2008 and it intensified the recession. They made another mistake in that they let the inflation in the stock market leak into the commodity markets in 2008 causing oil and gasoline to surge higher exacerbating the pressure on consumers. 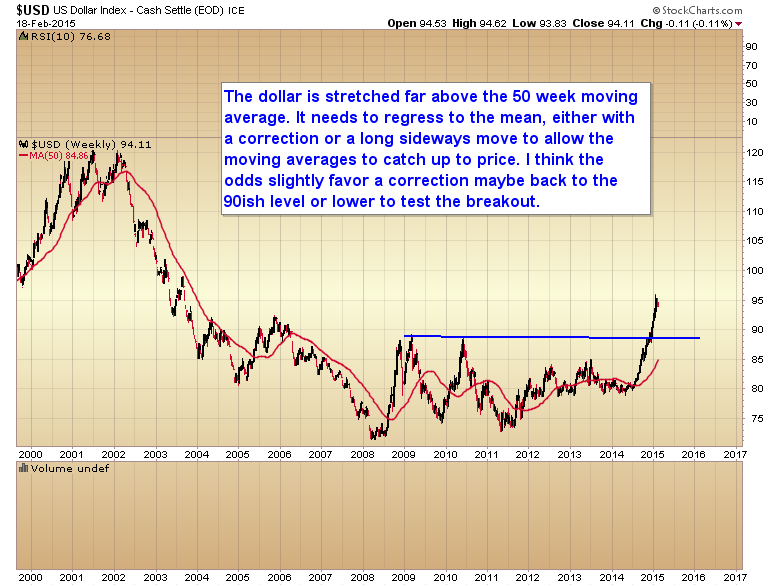 They almost made the same mistake in 2011 when QE 2 came to an end. I would argue that they learned their lesson and realized it’s easier to prevent a correction from getting out of hand rather then trying to repair it if it does. Notice it took them almost 6 months to get the market back to making new highs after the crash in 2011. By 2013 intermediate corrections had become few and none of them were allowed to retrace more than 38% of the previous rally. I would argue that they will not make these mistakes again. 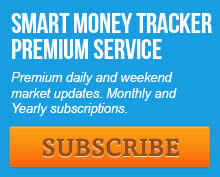 Stock markets will be propped up this time to hold off the next recession for as long as possible. 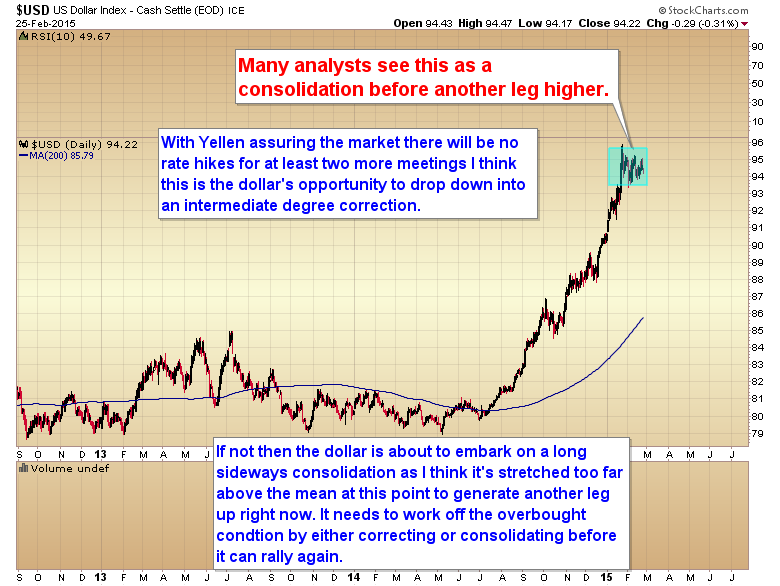 I’ve watched over the last several years as one correction after another has been terminated prematurely. 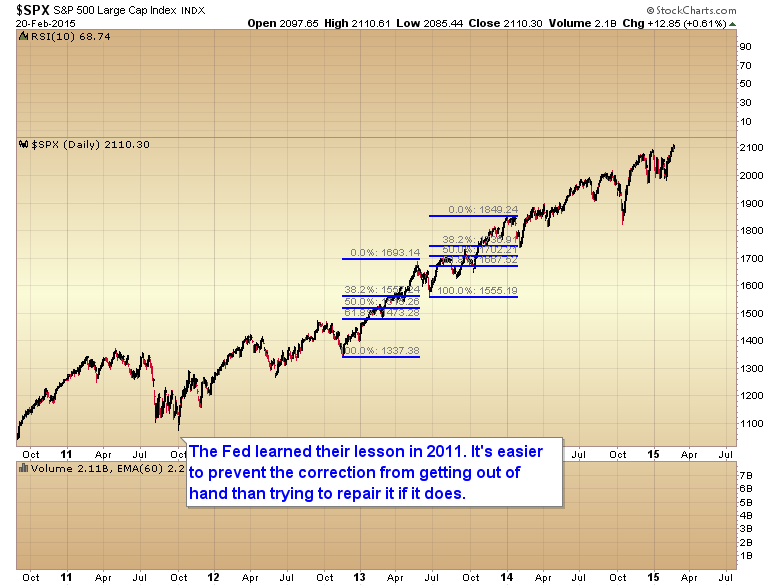 It became blatant in Oct. when Bullard and Williams threatened the market with more QE if it didn’t reverse. And most recently what should have been a deep intermediate correction was aborted and the market pushed back to new highs. Let me explain. Any professional trader knows the old Wall Street saw that triple bottoms almost never hold. 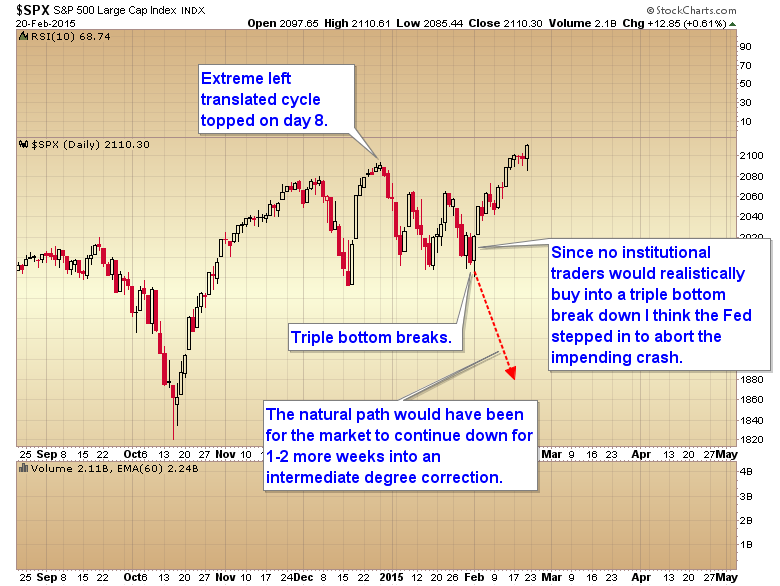 Three weeks ago the market was poised to break a triple bottom. 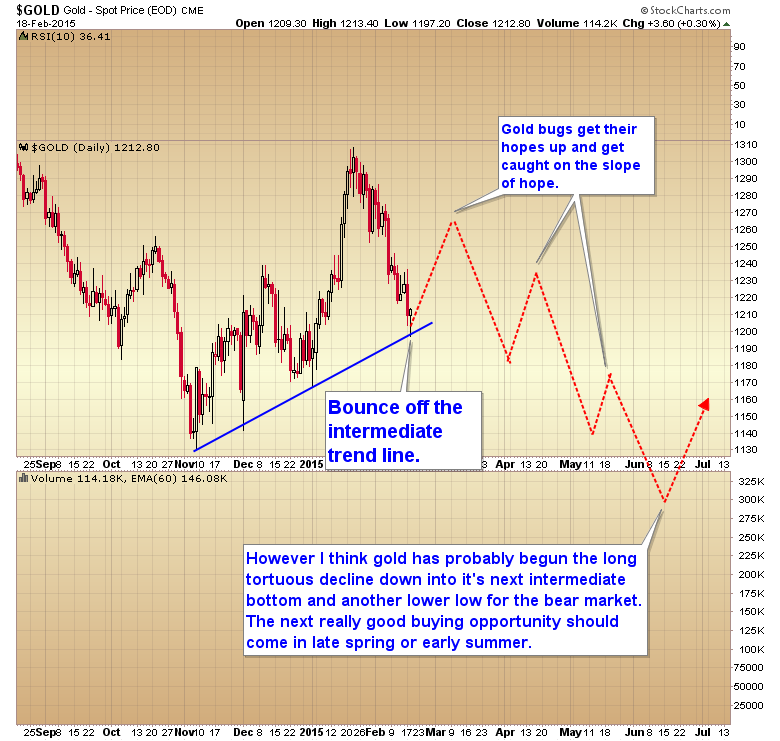 It was still early in a left translated cycle (bearish pattern). 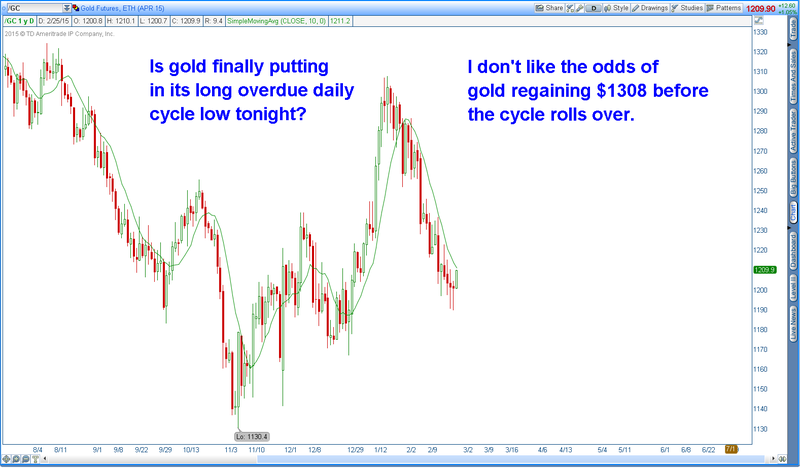 The daily cycle still had another 1-3 weeks before entering the usual timing band for a cycle low. 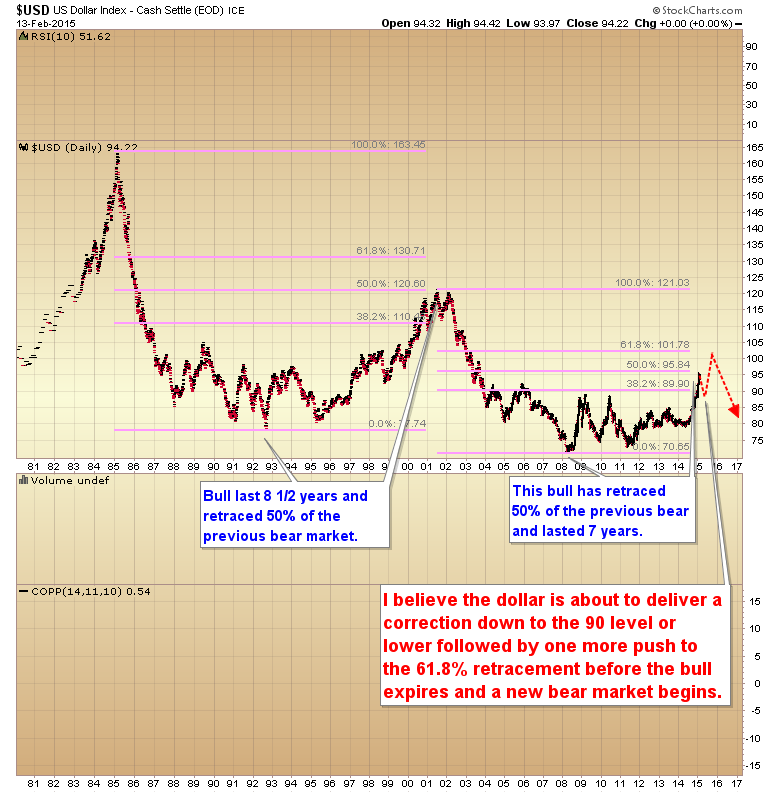 Once that triple bottom gave way the market should have dropped down heavily into an intermediate degree correction. But miraculously on the very day that support broke the market reversed and the triple bottom breakdown failed. 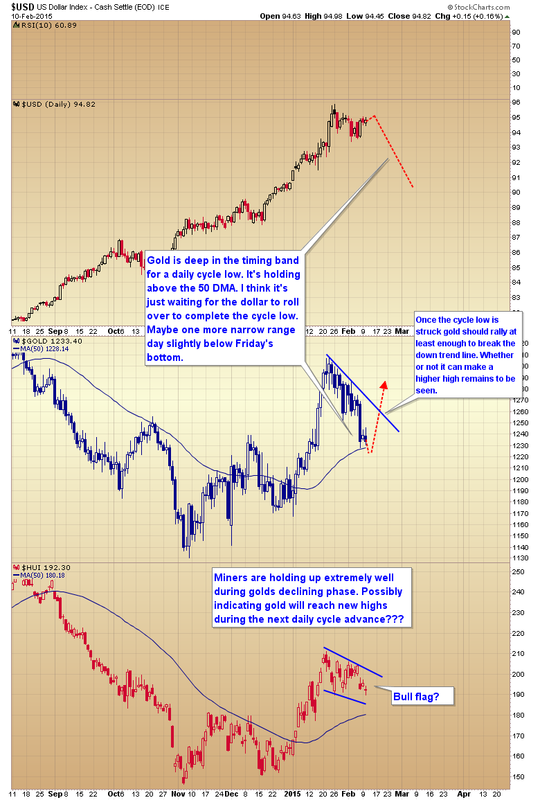 The daily cycle bottomed a full two weeks before it should have, and a crash or semi crash move down into an intermediate bottom was avoided. So one has to ask themselves, if every professional knows that triple bottoms don’t hold then who were the buyers that bought into the break and stopped the decline. It seems blatantly obvious that the powers that be recognized the crash risk and took action to stop the move before it got started. Most recently the crash in oil has threatened the banking system as the fracking industry is likely to go bankrupt dumping billions in bad debt back in the lap of Wall street. 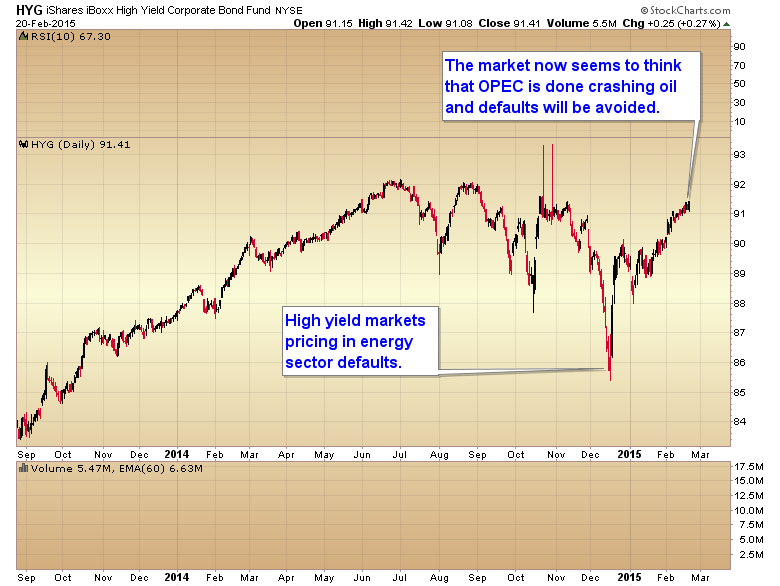 However based on what is happening in the high yield market it looks like that sector is going to be rescued also. 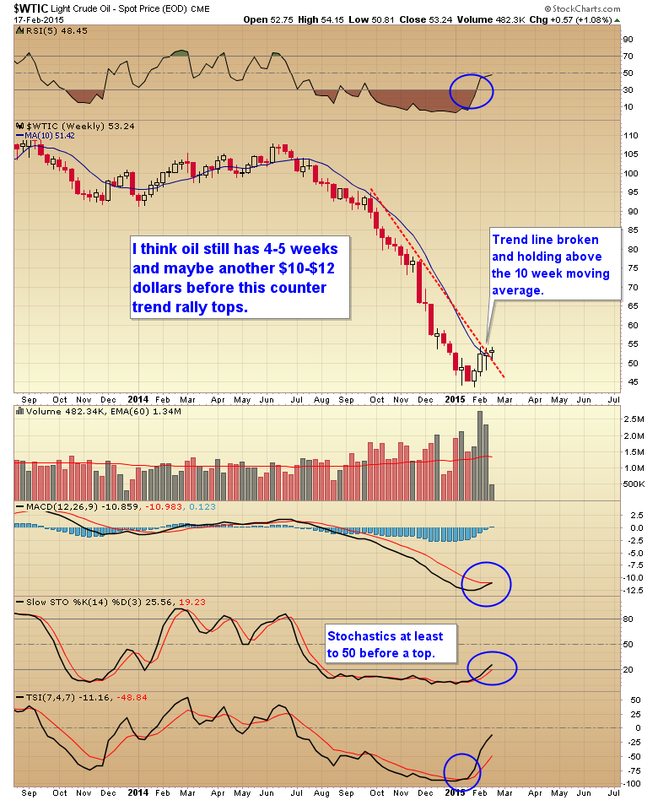 Which makes me wonder if oil has just been added to the list of markets to be artificially propped up. Come to think of it I haven’t seen any OPEC statements lately. Several months ago they made it a point to trot a spokesman out every other week and inform the market that they would not cut production. That negative campaign seems to have come to an end. So with central banks propping up markets, the easy money is to just buy any and every dip. But how long can this go on you ask? I would venture to guess that it will continue until the Fed makes the mistake of allowing the next bubble to form and pop. 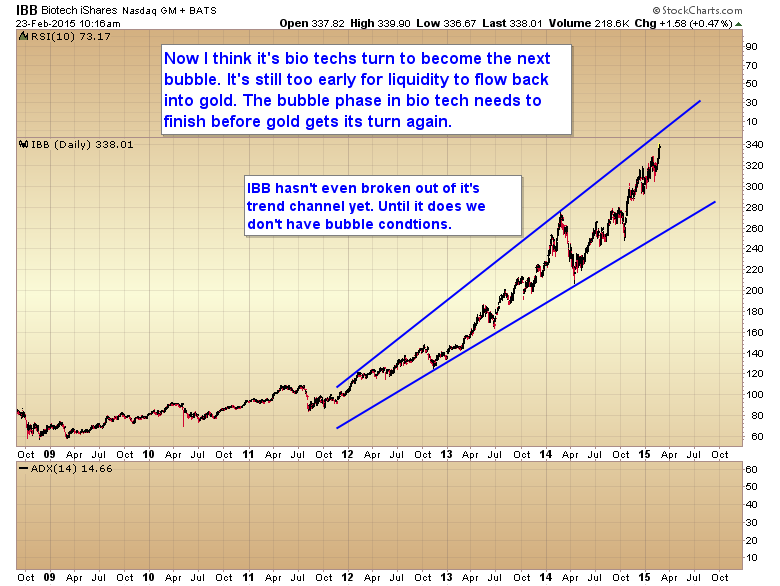 In my opinion that bubble will occur in the bio tech sector. 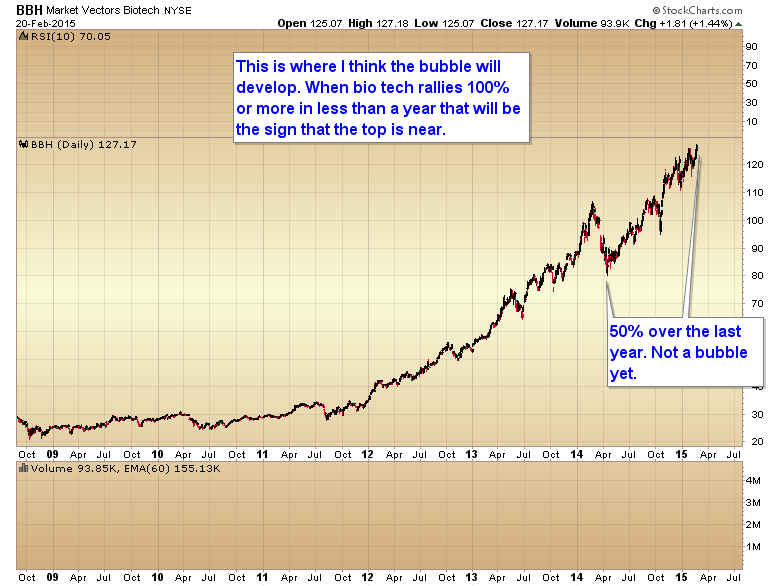 So I’ll be watching the bio tech market for parabolic behavior as a sign that the bull market is nearing an end. 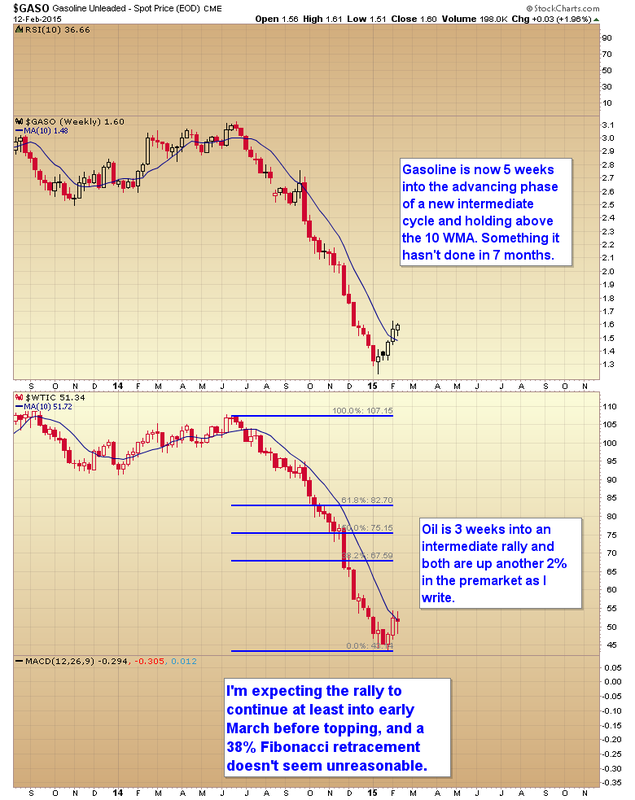 When we see IBB or BBH rally 100% or more in less than a year then we will be getting close to the end. 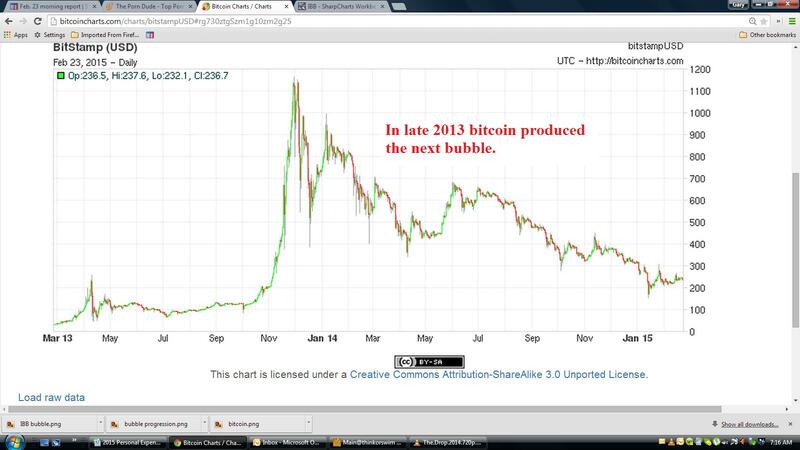 Once the bubble pops and the parabola collapses no amount of Fed intervention will be able to save the market. So while I think we will probably get at least a temporary top once the Nasdaq has tagged 5100 (or more likely marginally above that level) I doubt that will be a final bull market top as the biotech sector clearly hasn’t entered a bubble phase yet, and I question whether the Fed will allow the next correction to dip much more than 5%. I suspect they don’t want a repeat of October, and they will certainly avoid at all costs a correction deep enough that would force another round of QE. This entry was posted in Uncategorized on February 22, 2015 by Gary. This entry was posted in Uncategorized on February 19, 2015 by Gary. This entry was posted in Uncategorized on February 18, 2015 by Gary. This entry was posted in Uncategorized on February 15, 2015 by Gary. This entry was posted in Uncategorized on February 13, 2015 by Gary. This entry was posted in Uncategorized on February 11, 2015 by Gary.